The Mech-El/MEI 709 is a manual eutectic die attacher. 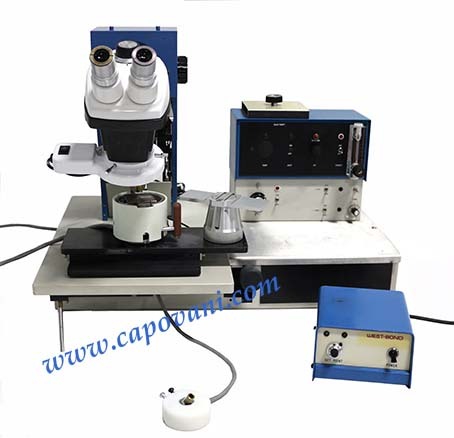 The machine comes with a 2 position slide table for die presentation and heated work holder. The MEI 709 uses a unique hot gas head that allows the user to heat the package to a temperature below the wetting temperature of the solder and use the hot gas to bring the localized heat to only the die area to wet the solder or perform. Hot Gas Head: Quartz heater produces 500 degree C. gas. Tip Weight: 0 to 200 grams. Collet Mount: Cold or heated tool holder. Tool temperature from 25 to 400°C. Multi-Collet: Manually select between one or four tools. Hot Gas/Scrub Timers Option: Individual time adjustment from 0 to 3 seconds. Chip Dish: 2" diameter mirror die dish and 2" x 2" Fluoroware carrier. Slide travel is 3" (7.62 cm) standard.